To celebrate the launch of our book, we’re going on a blog tour this week! This is the first stop. Tomorrow we’ll be at Cold Climate Gardening. Then on Wednesday, we’ll fly our way over to Garden Therapy. We’ll also be visiting Summers Past Farms, and we’ll complete our tour close to home on Friday at Dragonfly Shops & Gardens. Make a comment here or ask a question, and you’ll be entered in a drawing to win a free book. Follow us on the tour, and you’ll have the opportunity to win even more books! See you on the tour! 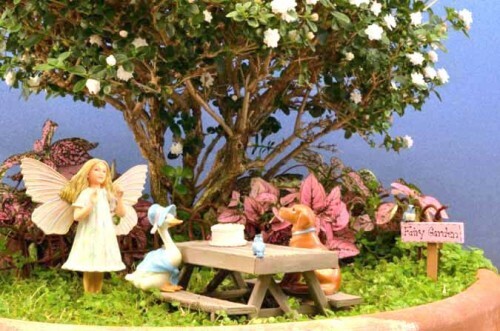 Why make a fairy garden? There may be as many reasons as there are people who make them. For me, it started when I made the dollhouse I had always wanted – but never had as a child. While the house was lovely, it was the tiny garden that really captured my fancy. After years of friends commenting on how wonderful it would be to have a real living miniature garden – I decided to give it a try. Rather than dolls, I populated my mini-scapes with beautifully detailed fairy figurines. Hence the name ‘Fairy Gardens’! Fast forward twelve years. I have given numerous design classes, counseled countless numbers of fairy garden devotees, and enjoyed every second of it! And now with my co-author Julie Bawden Davis, we have created a book to help everyone design their own enchanted little garden. 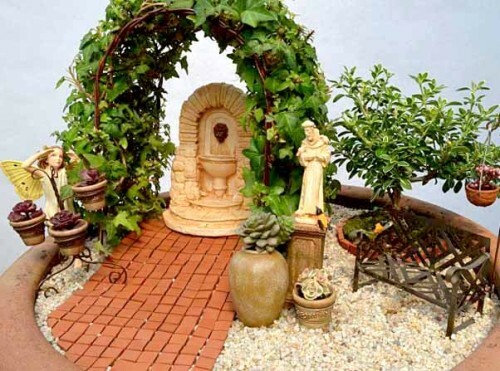 So the question remains, why make a fairy garden? After all, any type of gardening is good for you. Gets you outside. Connects you to nature. Eases your stress. Why choose to design a lillipution size landscape if you have plenty of space? Well, I’ll share a little secret with you. You see, twelve years ago I discovered a time machine. In one afternoon it can transport me back and I become 6 years old again. Remember being 6? Remember summer vacation days when you could pretend to be whatever you wanted? A princess or pioneer woman, movie star or nurse. Maybe you’d be a world famous baton-twirling roller skater performing astonishing figure eights in your neighbor’s driveway. Each morning awoke bright with possibility, every evening yawned to a close after a day filled with fun. And then we all grew up. And got jobs. Got married. Had kids. Had careers. Had both. And forgot how to play. Really play-not just sitting in front of a screen filled with computer generated outcomes. Making a fairy garden gives you back that sense of wonder. They make the worries of the world go away. It’s just you and your own perfect place. What’s not to like? Those of you who have already made fairy gardens know what I mean. For anyone just thinking about making one, welcome! Welcome to the world’s most wonderfully addicting hobby. And welcome to feeling like a child who can do or be anything you want. Leave a comment or question on this post by 12 p.m. PST March 24th to be entered into a drawing to win our book. One signed copy to be given away. Winner will be chosen randomly using Random.org. A valid email address is required for notification and recipient must have a valid U.S. or Canadian mailing address. Oh boy! Fairy Gardening caught my attention way back when I first saw it at M & M Nursery in Orange. It’s been so much fun since then with all kinds of new fairies and accessories and teeny tiny garden things. 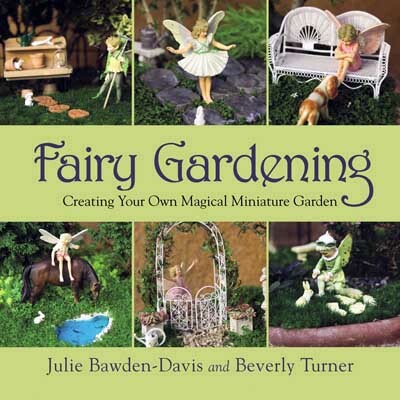 As a fairy garden devotee, would love to win the book. Love the fairy gardens where there is no right or wrong and you can escape into fantasy land! Bev, you never cease to amaze me! I have received my copy and it is a beautiful and well illustrated book. I can not wait to begin my own Fairy Garden. I plan on introducing this to my 7 year old grand daughter Camryn in the next couple weeks, it will be a hobby we can share and grow with together. ME ME ME!! Can I get it autographed,too? ;) Very excited for you (and us!). I’ve shared your site on FB and hope you get lots of attention. Sending love love love always! Bev you are one of my idols because my fantasy since childhood has been to be as small as Thumbelena and live in environments like theses! Your creations never fail to transport me back to those childhood feelings of magic and delight. I look forward to reading your book and savoring every page. Thank you for finally making this book! I can’t wait to get a copy of your book! I’ll be following your tour. We have to get together to celebrate. Would love a chance to win the book. I have been fairy gardening for the last 7 years. I love that it seems that more and more people are starting to do it.